This September sure has gotten off to a super start. First, there was Linda – who graced one of the three Harper’s Bazaar covers created and curated by Carine. Kate is another one who is no stranger to September cover graces. She’s given face to more than her fair share. No plasticity, here. Photography by Craig McDean, styling by Olivier Rizzo. 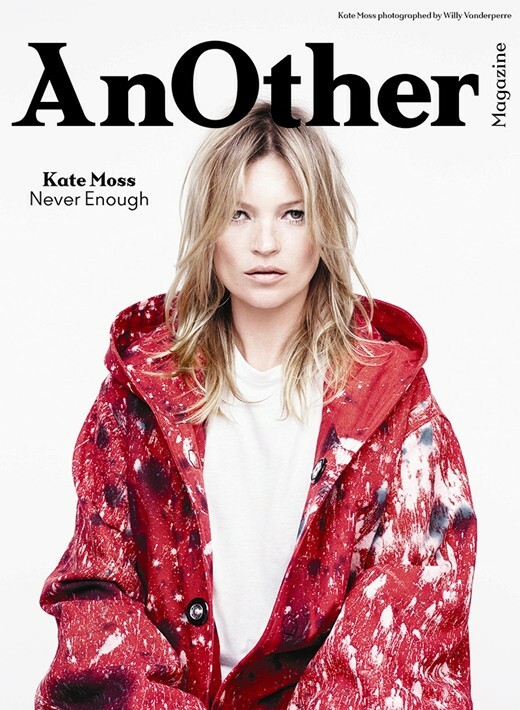 Well, she’s scored four covers for the A/W 2014 issue of AnOther Magazine (one for each decade she’s existed in this fashionable universe?). I don’t love the pose but I do love the dark locks by hairsmith, Sam McKnight. Photography by Collier Schorr, styling by Katy England. What? You were expecting someone else? Photography by Alasdair McLellan, styling by Alister Mackie. Oh, and there’s a fifth cover to come tomorrow – a digital dalliance with Burberry. I’ve got September covered. Photography by Willy Vanderperre, styling by Olivier Rizzo. I like the crispness of September, and the reign – that glorious, superior reign. In this case, I’ll need the paper issue – AnOther Mag always takes it to another level. I’ll have more Super sightings in the coming days. I mean it this time – I’m in ‘back to school’ mode. This isn’t the first time we’ve had a Super September, by the way…and it won’t be the last. Read past posts about Kate, La Linda and the other Supes. Images: Photo credits as noted, all via AnOther Magazine.